In a recent study from Harvard University pertaining to pasteurized milk ,the lactose beverage high in calcium that ensures strong bones shows very high levels of estrone sulfate.Estrone Sulfate is an estrogen compound that has been connected to prostate, breast and testicular cancer. It is the primary prognosis indicator for prostate cancer. Is pasteurized milk bad? Anything that causes cancer can't be that good for you. The Harvard Study was headed by Dr. Gnamaa Davaasambuu, Ph.D and a team of fellow researchers. Together they empirically identified a definitive link between the estrone sulfate concentrations in modern dairy farms and increases in cancer. Any farm that practices concentrated feeding operations is interested solely in profit margins not human or animal health. What this means is high heat treated or pasteurized milk can contain blood, puss, feces, painkillers and antibiotics at deemed allowable levels by the U.S. Department of Agriculture. When milk is pasteurized it becomes denatured or loses nutrients in the process. This comparative analytical study looked at the source of the cancer from modern dairy farms where cows are milked 300 days of the year. Even when they are pregnant!! That data was then compared to a raw milk farm in Dr. Davaasambuu’s native Mongolia which sequestered milk from cows only after the first six months the cows gave birth. The final results that were determined were contrary to that of the Centers for Disease Control (CDC). U.S. Department of Agriculture (USDA), The Huffington Post, USA Today and the milk lobbyist insistence that pasteurized milk is safe to consume. 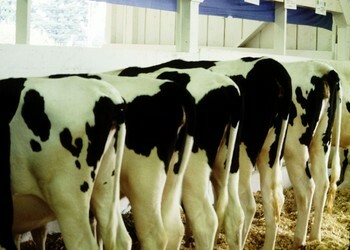 Much to their chagrin pasteurized milk contained roughly 33% more estrone sulfate than raw milk. Dr. Davaasambuu’s Agricultural Farming Study controversy between raw milk and pasteurized milk concluded that such high hormone milk and high rates of hormone dependent cancers are correlated to pasteurize dairy farm foods. When it comes to diets we must remember Caveat Emptor or let the buyer beware. Become aware of what you are eating and what the ramifications or benefits are before you ingest it. Raw grass fed organic milk improves health by aiding in digestion from the active cultures present in the raw milk. Raw milk has also been known to heal auto immune disorders. Eating locally means from a farm rurally, urban community farm or any local produce grown organic market.